This is a guest post from fellow travel-lover, Heather of The Urban Gypsy. You can read more about her travel tales on her website, and learn more about her in the bio below. In this article, Heather shares her highlights of a trip through Laos! Through all my travels I can honestly say that one country stands out as a top contender on my list of suggested places to travel. This would be the little, landlocked country of Laos. This hidden gem is often overlooked by travelers because it stands in the shadows of its more popular South East Asian destination stops like Thailand or Vietnam. But I guarantee that even though it may not be on the front of every travel brochure, you too will leave feeling like you just stepped out of a fairytale. *Start planning your trip to Laos! Check out this backpacking guide to Laos, which includes costs, transportation, visas, health, safety, currency, accommodation and much more. Laos’ capital city of Vientiane is an old French colonial trading post. This city is both abundant in French architecture as well as beautiful, ornate Buddhist temples. Even though it is the country’s largest city, it has not lost its friendly and laid back character. 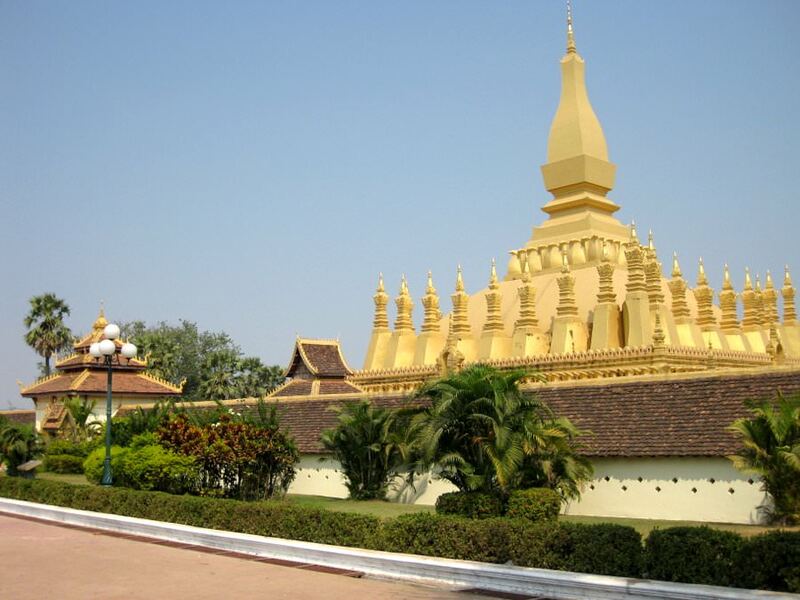 Don’t miss out on visiting one of Laos’ most sacred monuments – That Luang which is also known as The Great Stupa. Dating back to the 16th century this massive golden temple is jaw dropping as its central stupa stands 148 feet tall! Another distinct landmark of this city is called Patuxai Victory Monument. This giant arch closely resembles France’s Arc de Triomphe but is intricately carved with images of Hindu Gods and topped with Laotian style towers. The Vientiane Night Market is also a must see. It is targeted toward tourists with rows upon rows of interesting souvenirs to buy. What makes this market so special is that it is located right along the Mekong River and as the sun slowly sets you can’t help but be captivated by this city’s tranquility. Driving through the countryside is a must. The roads may not be in the greatest of conditions, but the views are like nothing I’ve ever seen. Even though Laos remains one of the poorest countries in the world I can honestly say that the poverty isn’t as apparent as in other countries that I have visited. There isn’t a huge disparity gap between rich and poor which I believe results in people being happier and more respectful of the land they live on. 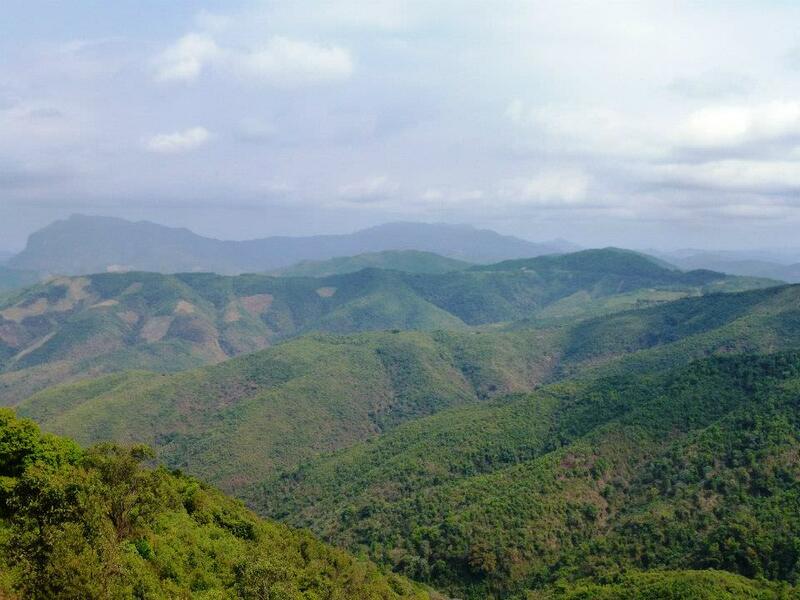 The countryside in Laos is stunning! 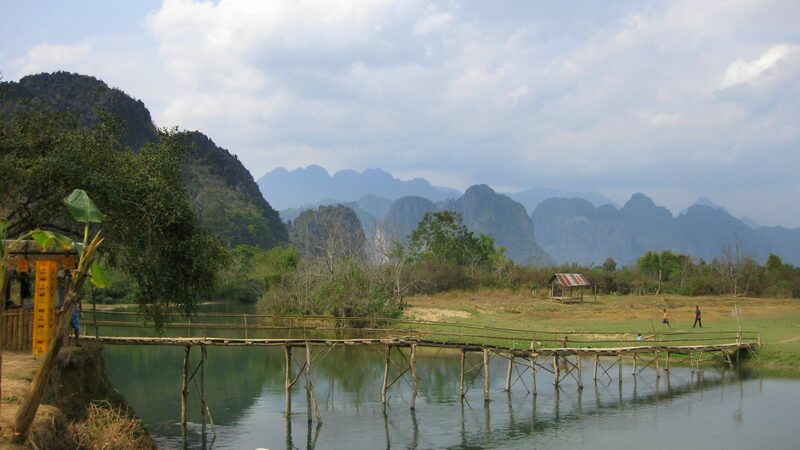 Traveling north to the town of Vang Vieng is like arriving in a complete sanctuary. This little town is nestled among massive limestone mountains and bright green rice paddies. It used to be known as a party town where backpackers would come from near and far to float down the Nam Song River in inner tubes while stopping at bars that lined the river banks. The government however has shut down the party scene making Vang Vieng the perfect place to explore and take in many of the river activities. I would definitely take the day to float down the river as this is one of the most beautiful backdrops you imagine. Another place not far from town that is worth checking out is the Blue Lagoon. This picture perfect lagoon is a tempting shade of blue and comes fully equipped with rope swings and platforms to dive off of. There are also covered places to sit and relax, and just steps away are the Tham Phu Kham Caves. Inside the dark and cool caves are Buddhist shrines which make the trek up that much more spiritual and surreal. Luang Prabang is the next suggested stop on your visit to this fantastic country. The city itself is a Unesco Heritage Site and it truly is a traveler’s paradise that is so rich in culture and beauty. 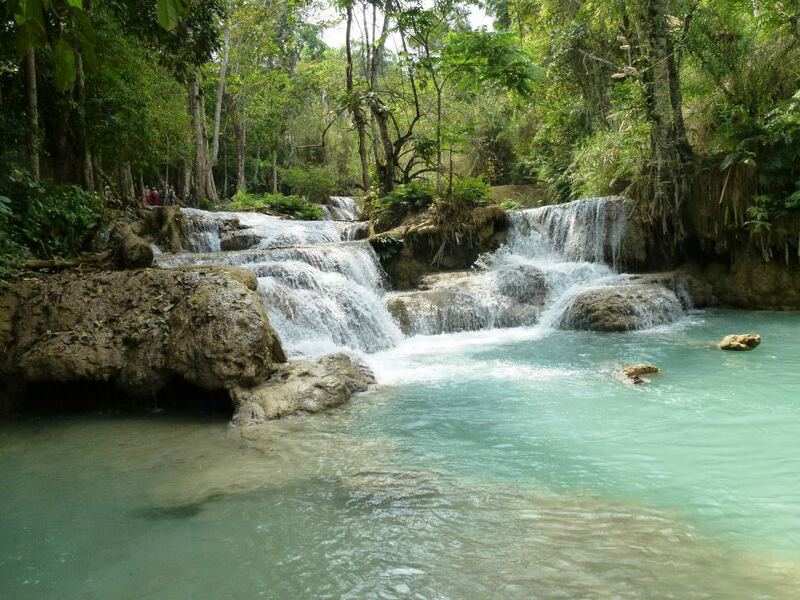 Not far from town are the Kuang Si Waterfalls. Hidden in the middle of the jungle is an oasis like nothing else. These magnificent multi-tiered waterfalls have turquoise blue pools to swim in. To top it off there is a Black Bear Rescue Center located between the park entrance and the waterfalls. The Kuang Si Waterfalls are stunning! Seeing these sleepy bears close up was definitely an added surprise to an already amazing excursion. Visiting the Mount Phousi Temple is another must. You may swear while climbing over 300 steps to get to the top, but visiting the seven-tiered golden pagoda of Wat Chom Si is well worth the effort. Not only is the temple a sight to see, but the panoramic views over Luang Prabang is one that you will not want to miss. And finally you wouldn’t want to leave Luang Prabang without experiencing one of Laos’ sacred traditions – giving daily alms to the Monks. Monks are only allowed to eat food which has been donated to them before noon. 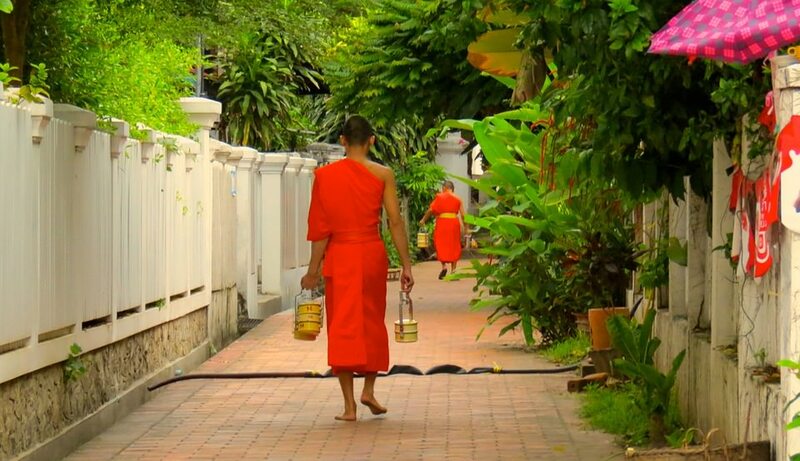 Bare foot and draped in bright orange robes, they make their way to the temple before sunrise. If you wake up early enough you can line the streets and wait for them to give them their alms. This is truly an unforgettable experience and one that forever will be embedded in my memory. These are only a few of the highlights of such a unique and dream-like country. The pace is slower, the people are friendlier and it is one of those countries that doesn’t feel like it has been tainted by mass tourism yet. I urge anyone who is traveling to South East Asia to include Laos in their itinerary. I promise that Laos will hypnotize you, and leave you wanting to come back for more! 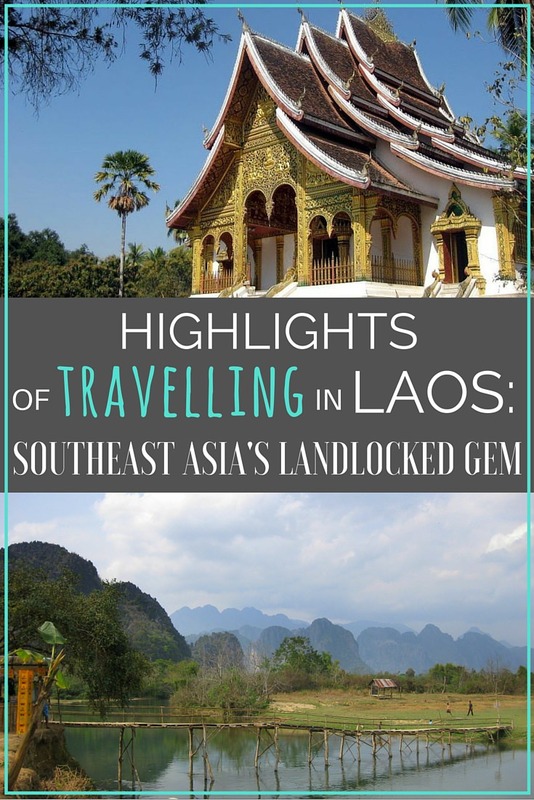 Have you travelled to Laos before? Which highlights would you add to this list? Tell us below! Hi Heather, great post and photos! I completely agree – Laos is probably one of the most under-rated travel destinations in Southeast Asia. Absolutely gorgeous place to visit and wonderful people. Thanks so much Josh! It is definitely one of those places I hope to one day go back and visit! So beautiful and the people are equally as amazing! I wish we had spent more time in Laos. When we had arrived in Luang Prabang, we’d be been travelling for three months and had started to burn out. We loved Luang Prabang so decided to based ourselves there for a couple of weeks to recharge. However, this meant we didn’t get to explore anywhere else. It’s definitely on our must go back to places. What was your experience of alms giving like? We were looking forward to seeing such a beautiful tradition – however, it was totally spoilt by disrespectful tourists chasing monks down the road and shoving cameras, with flash, in their faces. We left the experience feeling pretty disgusted. I definitely recommend trying to see the alms giving, but also recommend finding a quieter street where you can watch at a respectful distance and hopefully, not witness tourists ruin a wonderful tradition. That is terrible! Honestly my experience was nothing like yours. There were just a few of us on the street waiting in the dark before the sun began to rise. Everyone was quiet and it was incredibly peaceful. Hearing stories like your makes my stomach turn for sure. As travelers my hope is that we can experience other’s cultures without tainting or ruining it in any way. I’m reading this a day before my wife and and i leave for Laos. We’ll be there for a year (volunteering) and this post has whetted my appetite. Thanks for sharing. Laos is cool, despite the rampant natural resource extraction by its northern neighbor. If you have time, travel Muang Sing, a smaller market town in the northwest. From there you can do some really nice trekking. Laos is one of my favorite countries! Great article. Highlight for Laos for me were exploring the Plain of Jars in Phonsovan and doing a 4 day motorbike trip from Tha Khaek! Don’t underestimate was the southern part of Laos has to offer as well 🙂 The loop was probably the best thing I’ve ever done in Southeast Asia – self driven loop around the hills and mountains of Laos exploring caves and waterfalls as we go. Just amazing! That’s fantastic Clare! We too loved Laos, and had a motorbike for the Boulevan Plateau around the Paske area – falls, beautiful scenery, etc. Would love to do the route you mentioned 🙂 Cheers! Laos is one of my favourite cities, was there for a week last year and loved every minute of it! Yes, Laos is a great country for travelling. Glad you enjoyed! My husband and I are living in Laos with our baby and enjoyed reading your summary of this lovely country. We have enjoyed exploring all the sites that you mentioned. I would also recommend adding COPE’s Visitor’s Centre (http://copelaos.org/visit.php) in Vientiane to learn about the affects of unexploded ordnance (UXO) on the livelihoods and quality of life for many Laotians. Also, visiting the Kong Lor loop in Khammouane province and riding in a motorboat through a 7 km-long karst tunnel is a must-do! The people are amazing but the disparity between rich and poor is enormous.